Posted 5 March 2015 under Ask Us. Of course! With PCOS, it is okay to have anything you want but what is important is to keep in mind the portion size and how often. Potatoes are carbohydrates which provide our body with energy and fuel our brain. With PCOS, it is helpful to focus on high-fiber, low-sugar carbohydrates in order stabilize insulin levels. Potatoes are not necessarily a great source of fiber but if paired with a healthy fat and lean protein it will help to delay the release of sugar to your blood stream. 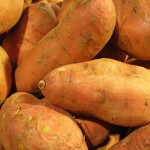 If you love potatoes, you might want to try sweet potatoes which are higher in fiber and lower in sugar.